We are honoring Harvest season! 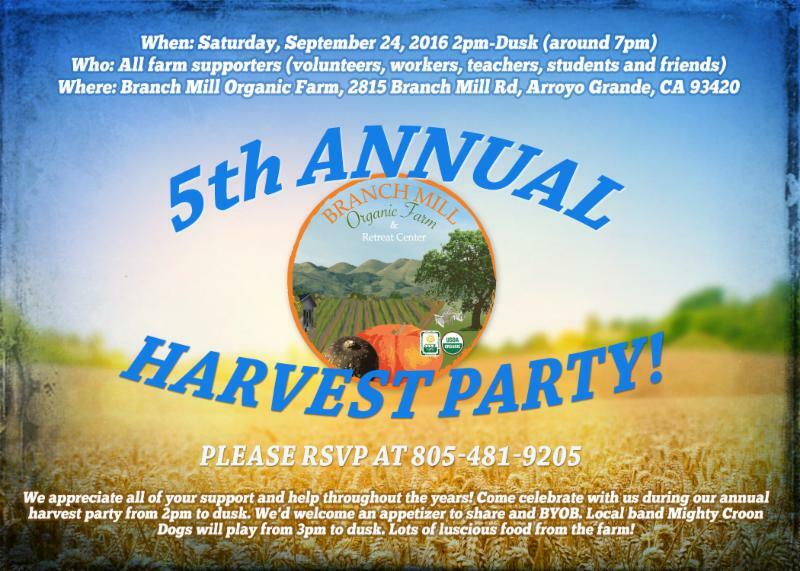 To celebrate we are having our 5th annual Harvest Fest on Setember 24th from 2 until dusk. Mighty Croon Dogs are going to get things hopping and lots of great food all from the farm. Hope to see you here that day. (Sssshhhh, it’s my dad’s 95th birthday celebration too). 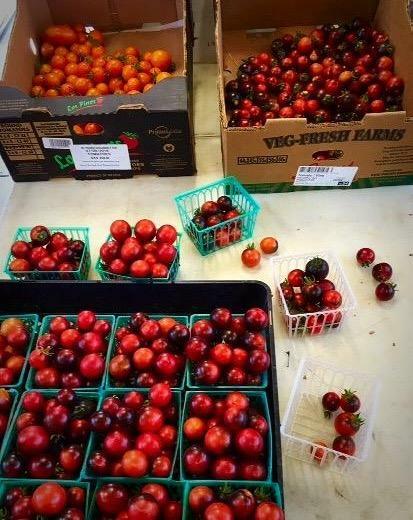 The farm stand is always open every day. It’s an honor stand so you just put your money in the slot. 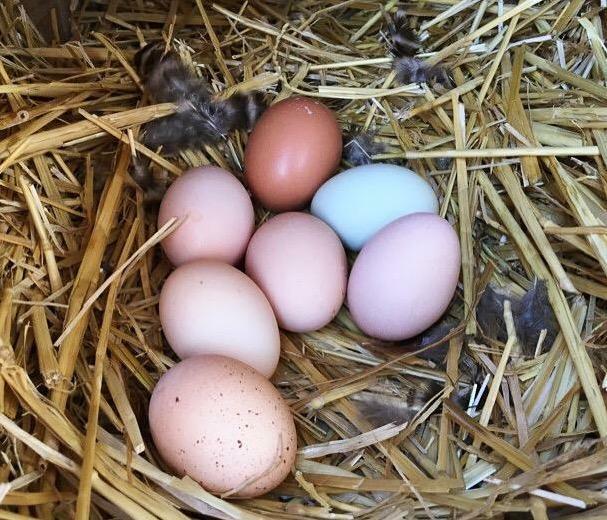 We have LOTS of fresh brown eggs with 22 hens now laying delicious eggs- all fed pure organic/non-GMO feed and scratch plus all the greens from the farm that they love to eat. We also have yummy garlic (just cured), tomatoes of all kinds and peppers (mild -hot), yellow crooked-neck squash, green beans, cucumbers, lemons, kale, chard, beets and herbs; sage, rosemary, thyme, Genovese basil and oregano, but we don’t put them out as they wilt in the heat. Just call us (481-9205) and we can pick you whatever you’d like. All are certified organic from the farm. Take Huasna Rd. and follow the signs: Organic Farm Stand. Certified organic sunscreen, bug balm and bug spray plus many tinctures are the hot sellers this summer. Dinosaur Caves Park in Shell Beach; every first Sunday of the month, beginning June through November. Hope to see you September 4! Hope you can make it, please email Ruth with any questions Send me an email! An evening where we drop into silence after listening to something inspirational from a favorite Meditation book. Then Ann Kathleen will play a Tibetan Singing bowl with tingshas as we begin to sit in silence which lasts for about 20 minutes. After the meditation she will play the harmonium and lead us in singing chants from around the world. Come and feel the peace of introspection then help create a beautiful sound filling the room with music and mantra, singing to the Divine. For more information go to Divine Inspiration-Body,Mind & Soul Mentoring click on classes and events. Come with an open heart, and be available to Letting Go of what no longer serves YOU!! Feel free to invite a friend or two. Please contact Deborah @ (650) 815 – 8910 to reserve your seat.